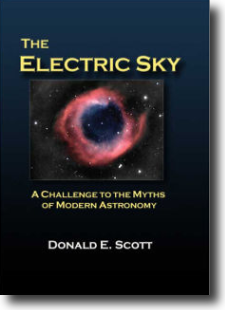 Converging scientific and historical investigation has led to a new vision of the Electric Universe. Popular ideas in the sciences must now give way to a deeper appreciation of electrical phenomena in space and in the skies above our early ancestors. 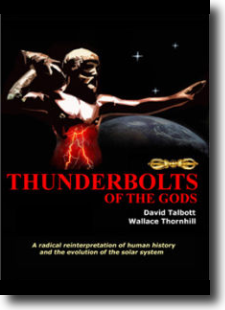 Thunderbolts of the Gods by David Talbott and Wallace Thornhill, The Electric Sky by Donald Scott as well as The Electric Universe by Wallace Thornhill and David Talbott are superb introductions to this wide-ranging subject. Just starting out? 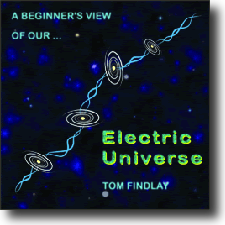 Don’t miss Tom Findlay’s A Beginner’s View of our Electric Universe. 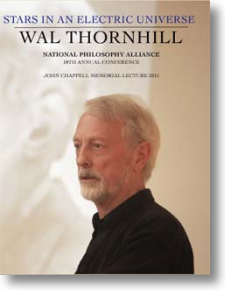 In this John Chappell Memorial Lecture, Wal Thornhill sets forth a unified paradigm where plasma is the dominant, universal medium and the electric force rules the cosmos. Wal’s message to conventional theorists is simple and direct: give up all mathematical contrivances and return to the solid ground of observation, deduction, and interdisciplinary synthesis. Based on more than four decades of systematic research, his broad understanding of discoveries in the laboratory and in space offers a practical way forward in the sciences. A physicist and natural philosopher, Thornhill stands on the shoulders of Kristian Birkeland, Hannes Alfven, CER Bruce, Ralph Juergens. Donald Scott, and others. In this John Chappell memorial lecture, he sets forth a unified paradigm where plasma is the dominant, universal medium and the electric force rules the cosmos. Cultural history may seem fragmented and contradictory. But as demonstrated in this introductory episode, there are also levels of deep agreement between the cultures. According to David Talbott, these “archetypes” allow for a radical reinterpretation of both human and planetary history. 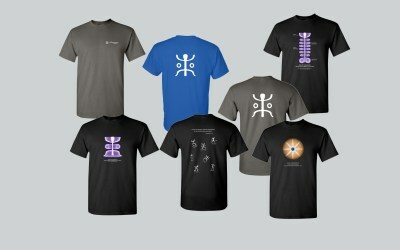 Competing regional symbols are aspects of “one story told around the world,” a story both awe inspiring and terrifying. 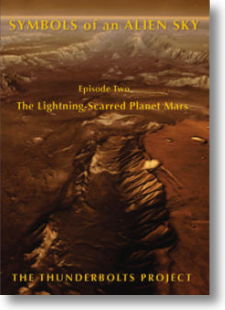 In Symbols of an Alien Sky Episode 2, The Lightning-Scarred Planet Mars, David Talbott takes the viewer on an odyssey across the surface of Mars. Exploring feature after feature of the planet, he finds that only electric arcs could produce the observed patterns. The high resolution images reveal massive channels and gouges, great mounds, and crater chains, none finding an explanation in traditional geology but all matching the scars from electric discharge experiments in the laboratory. 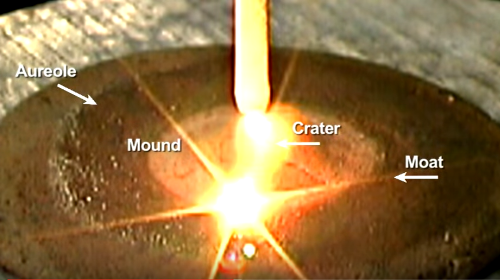 As a scientific follow-up to Symbols of an Alien Sky Episode 1, this DVD provides a definitive answer to the question: was Mars carved from pole to pole by intense interplanetary discharge? 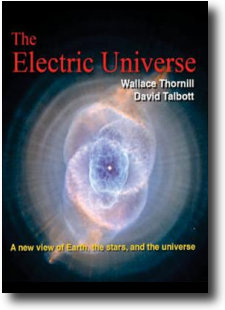 In Electric Universe Wallace Thornhill and David Talbott suggest that conventional astronomy gives a distorted view of the universe. The modern vision evokes a sense of lonely bodies in space—isolated galaxies, self-immolating stars drifting like dust motes in the blackness, and the clockwork solitude of planets. In challenging this idea, the authors emphasize connectivity. 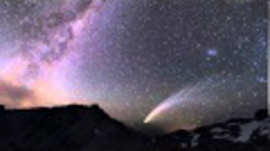 The electric force, they contend, influences matter at all levels, from subatomic particles to galactic clusters, leaving little room for the disconnected fragments of modern theory. 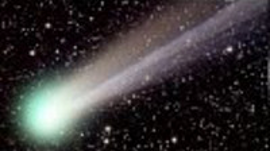 Primary subjects include: an introduction to the plasma universe; electrical challenges to Big Bang cosmology; discovery of the Electric Sun; and the electrical nature of comets. In language designed for scientists and non-scientists alike, the authors show that even the greatest surprises of the space age are predictable patterns in the Electric Universe. 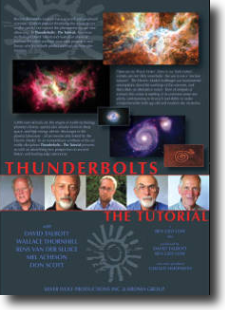 Thunderbolts–The Tutorial DVD introduces the key themes of the Electric Universe paradigm and includes interviews with the principal research figures. Two lectures are presented in one DVD. Professor of Electrical Engineering Don Scott summarizes the electric model of the Sun. Electric Universe proponent Wallace Thornhill discusses electrical scarring of planets and moons. Guaranteed to expand your view of the solar system. 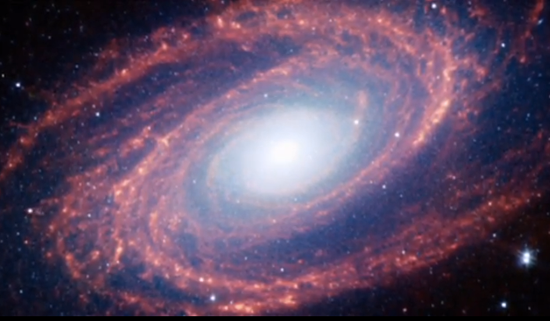 In this 60-minute lecture DVD, astronomer Halton Arp discusses a fundamental mistake of modern cosmology—the misinterpretation of red-shift. The first fatalities are the modern myths of the Big Bang and the expanding universe. 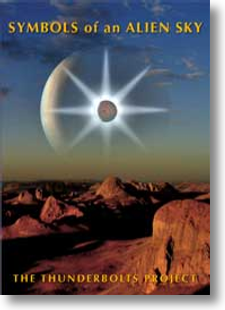 This powerful DVD present one of the models of the Saturn configuration based on more than two decades of systematic research and cultural comparison by David Talbott. 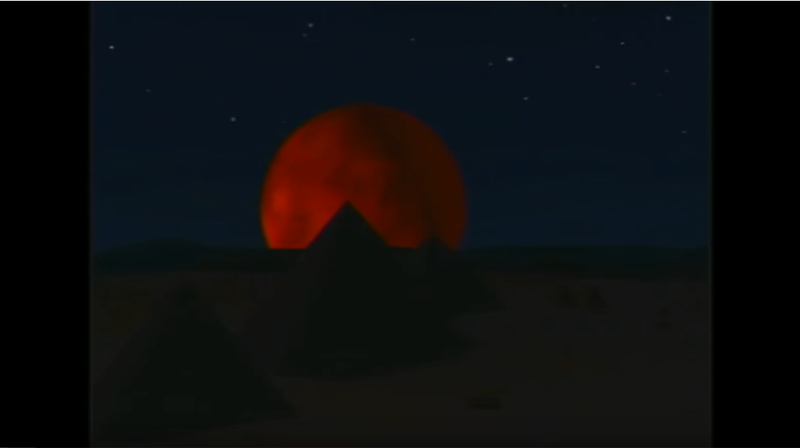 It reconstructs a cosmic drama when Solar System orbits were rearranged and gives a sweeping overview as to why the ancients worshiped the planets and were so concerned about these sky “gods”. Drawing on ancient sources and recent discoveries in the sciences, author Dwardu Cardona describes an ancient sky remembered around the world when early nations worshiped the planet Saturn as the first “sun” and the original “supreme god.” The author was the former editor of AEON: A Journal of Myth, Science and Ancient History. This book is the second in the series by Dwardu Cardona. Again, drawing from astrophysics, plasma cosmology, comparative mythology, linguistics, geology, paleontology, symbols, petroglyphs, art, religion and beliefs, Cardona builds a compelling argument for the reconstruction of prehistoric times. The overwhelming evidence explains the worship, temples, and monuments of the ancient people. The third book in the series by Dwardu Cardona gives a fresh, big-picture canvass concerning the lack of coherence in the current geological, palaeontological, biological, and astro-physical findings and models. Following on the heels of its two prequels, God Star and Flare Star, the present work proposes a unifying theme that not only resolves the above mysteries but also quite a few related ones as well. This book is the fourth in the series by Dwardu Cardona. The event of the Younger Dryas that followed the warming spell at the end of the Pleistocene Ice Age captured the imagination of scientists and laymen during the first decade of the Twenty-first Century. While the present work deals with the real cause of that occurrence, it is prefaced with additional evidence in favor of the theoretical model advanced in its three prequels in which it is argued that the primordial Earth had basked beneath a different sun than the one that presently shines above us. This previous sun is shown to have devolved into the present gaseous planet Saturn. The terrestrial devastation and the fear that the upheaval instilled in them, together with their attempt to placate its heavenly source, led our ancestors to ritual pacification in their long climb toward a hope-filled faith that ended in religion. Stated so briefly, the above disclosures are bound to evoke adverse reactions among those steeped in the modern mythology. However, those who are prepared to investigate new grounds, will discover another huge cache of integrated evidence presented between the covers of this work. In his most recent work, the late Dwardu Cardona offers a reconstruction of the cosmic events that led to the organization of the Solar System, adding notes on recent astronomical discoveries that lend support to this reconstruction. In particular Cardona highlights the catastrophic repercussions following the gas giant Saturn’s intrusion into the Sun’s domain, bringing along with it our own planet Earth. His analysis covers both the large scale slaughter of species and the beneficial effects from selective mutational evolution, including advances in the survival abilities of humans.